Description of decorations: Granite rocks. Dennerle Rio Xingu gravel which is close to the actual. JBL Sansibar Orange sand which is 100% match of the sand color in the actual biotope. Conglomerate rocks collected by myself from the actual type location in Gorgulho da Rita in 2016 on a hobbist/scientist expedition on Rio Xingu and Rio Iriri. The aquarium decoration in relation to the dimensions provide the ideal ground for the selected species as you may see from the underwater footage on my video after 1:37:00. Description of equipment: Heating: Schego titanium heater with Eliwel Temperature controller. Filter: Internal 3-stage side filter with 12 liters of biological filter media, 2 liters of mechanical filter media and denitrification resin as these fish are very sensitive to nitrates.The filter is powered with a 3.000lt/hour pump and a 8.000lt/hour wave maker is used in order to replicate the strong current of the river. Water parameters: Temperature: 30,5°C, pH: 6,3~6,7, TDS: 15 microsiemens. Description of the area surrounding the biotope: The Xingu Basin is the fourth largest tributary basin in the Amazon and with 507,000 km2 and it is nearly the size of France. Two-thirds of the Basin is in the state of Pará; the remaining one-third is in the state of Mato Grosso. The Xingu River is almost 2,500 km long and contributes approximately 4 percent of the Amazon River’s total annual discharge. The confluence of the Xingu and Amazon rivers is approximately 420 km from the Atlantic via the main river. Oceanic tides are evident at least 100 km up the Xingu. Most of the Xingu Basin lies within the Amazonian rainforest zone but scrub-savanna dominates the headwaters area. The rainy season in most of the Xingu Basin is from December to May and this is also the period of highest river levels. Where tides are felt in the lower Xingu, average annual river-level fluctuation is only 2 meters. Elsewhere along the main stem, the average ranges from 4–4.5 m. The widest range between known water levels is approximately 8 m.
Description of the underwater landscape of the biotope: Gorgulho da Rita (3°39’05.4″S 52°22’42.9″W) is a unique aquatic habitat. The area is very shallow during the dry season and fish live from 0 to 1-2 meters maximum depth. Beautiful large granite rock formations binding beautifully with the orange sand and the ancient iron-rich conglomerate rocks, which give to Gorgulho da Rita it’s unique characteristics. 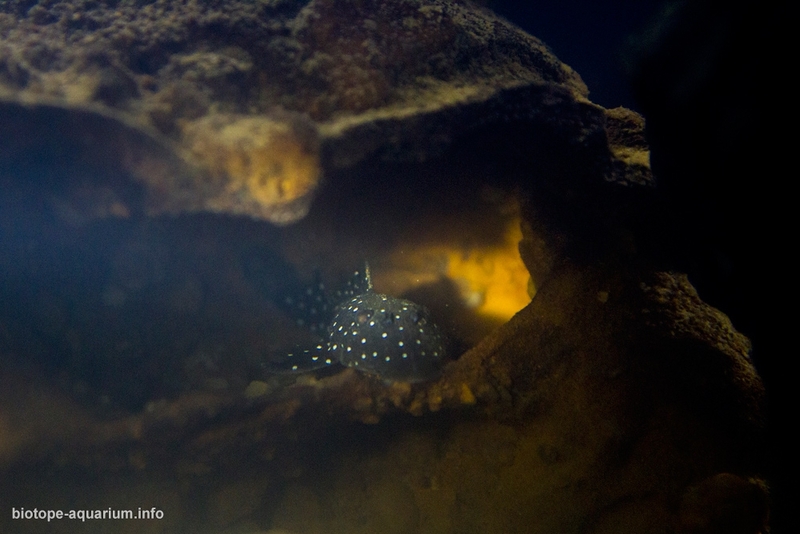 Most of the fish species use these natural crevices for shelter and for breeding area. It is quite common inside these caves to cohabit several different species of fish and in the same cave you can find ie. 3 different species of loricariids, rhinodoras, teleocichlas, etc. 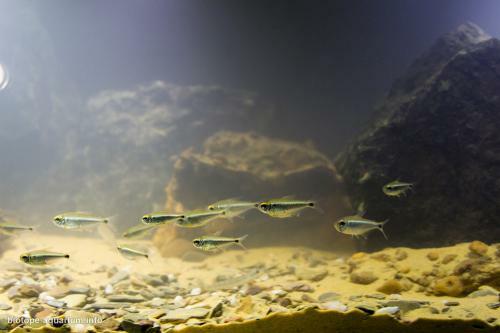 Many fish species form large groups such as Brycon pesu, Moenkhausia heikoi, Leporinus sp. and others, which swim among the rock formations, always searching for food such as aquatic sponges and bivalves, insects and Dorysa sp. Snails and try to avoid predators. The water current is very strong (although already affected by the Belo Monte dam) and the oxygen saturation is 99.99%. Description of the parameters of the habitat: The temperature is higher than 29 degrees throughout the year and in several meters in depth below water.In particular during the dry season it can reach to isolated pools more than 36 degrees Celsius and the fish can adapt to that, waiting for the rainy season and to be connected again with the main river. In the specific type location I measured on average: temperature of 30,6 Celsius PH 6,5 and TDS of 18microsiemens. List of fishes and invertebrates occurring in the nature biotope: Some of the fish occurring in the biotope: Ancistomus feldbergae, Ancistrus Ranunculus (L034), Baranistrus sp. (L019), Baryancistrus xanthellus, Brycon pesu, Bryconops alburnoides, Centromochlus schultzi, Diplodon obsolescens (mussels), Doryssa sp. (snails), Geophagus argyrostictus, Hemiodus vorderwinkleri, Hypomasticus julii, Jupiaba apenima, Leporinus fasciatus, Leporinus friderici, Leporinus maculatus, Leporinus tigrinus, Leporinus villasboasorum, Moenkhausia heikoi, Parancistrus nudiventris (L031), Peckoltia sabaji, Platydoras birindelli, Pseudacanthicus pirarara, Retroculus xinguensis, Scobinancistrus aureatus (L014), Scobinancistrus sp. ‘tubarao’ (L082), Spectracanthicus punctatissimus (L030), Teleocichla centrarchus, Tometes kranponhah. List of plants found in the nature biotope: In the type location only Rock formations exist and the only plants are above the water with the exception of the rainy season when several of them become submerged. Few Podostemaceae species exist but only in waterfalls. Threats to the ecology: The biggest threat of this habitat is ofcourse the Belo Monte dam. Since it started it’s operation it has significant impact on these clear and fastflowing waters as it slowed down significant the water movement and started the deposit of sediments in areas that was once before crystal clear.In detail, the morphology and composition of Xingu River substrates are extremely important for aquatic ecology and biodiversity. The Volta Grande is dominated by substrates consisting of fractured bedrocks, iron oxide crusts, gravels and sands. Ironoxide crusts allow for the formation of complex morpholo-gies in the riverbed. The Xingu ria has a more homogeneous riverbed mainly covered by organic-rich mud, with sand deposition in the ria head and on the shallow marginal portions of the channel. 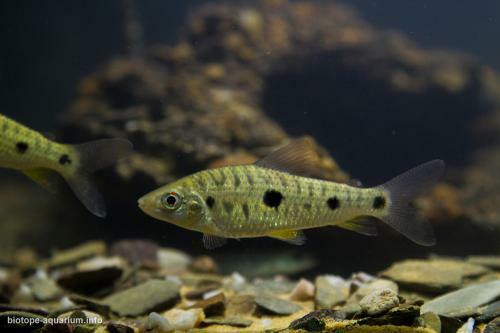 The substrate complexity in the Volta Grande offers more niche space, and is hypothesized to be a driver of diversity among rheophilic fishes in the Volta Grande compared to the Xingu ria. 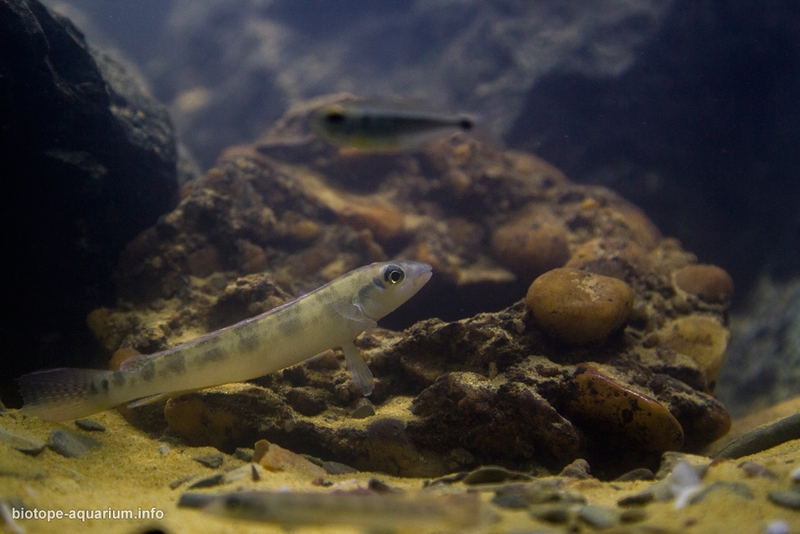 An old and stable system of clearwater and complex braids with rocky rapids is account for the exceptionally diverse fish fauna, especially with respect to lithophilic and rheophilic species like loricariid catfishes. 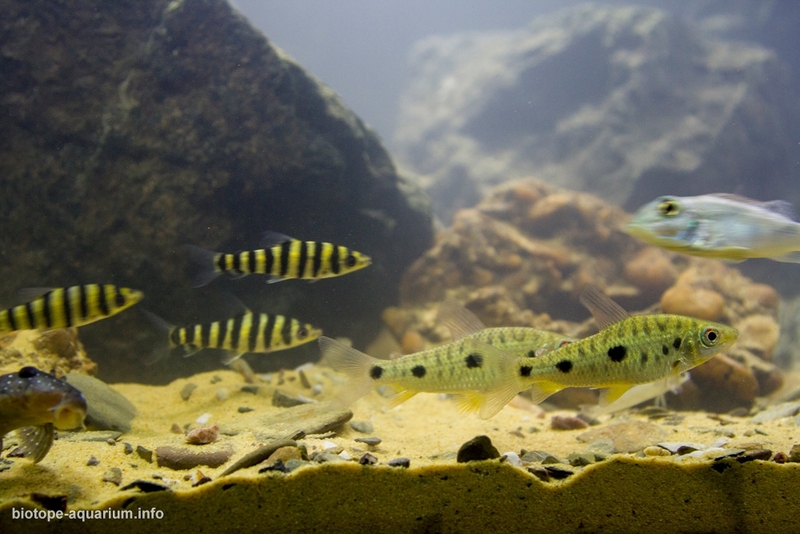 Furthermore, the clarity of the water is believed to enhance the effects of substrate composition and coloration on the color patterns of fishes, especially lithophilic species. Thus, the concentration of suspended sediments and its variation due to changes in hydrology and vegetation cover may play an important role in fish evolution and ecology. Also as the majority of the species living on this environment are evolved and adapted to the specific characteristics and this poses a serious threat especially when feeding, breeding, etc. When I visited the location on September of 2016 the effects of the Belo Monte where starting to appear. Further reports from my friends and scientists in 2017 shows clearly heavy sediment deposit and the cover of the once clear unique conglomerate rocks, in ‘mud’. Unfortunately the future of all species living there is uncertain and several studies are currently ongoing in order to identify the size of the impact of the Belo Monte dam. Us hobbists should try to breed more and more these unique fishes as some of them will be gone from the wild in the near future.